OSWEGO, NY â€“ Matt Doheny kicked off a three-day announcement tour across the 11-county 23rd Congressional District on Wednesday with stops in Oswego, Watertown and Canton. 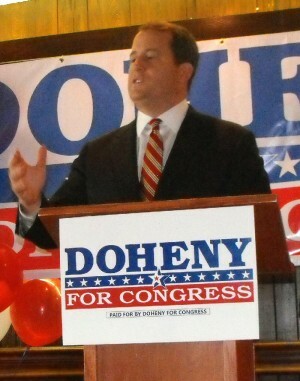 Doheny, who was raised in Alexandria Bay, is seeking the 23rd Congressional Seat. He now lives in Watertown and Alexandria Bay. A graduate of Allegheny College and Cornell Law School, he currently is a businessman who works as a portfolio manager for Fintech Advisory. Matt Doheny kicks off his campaign for the 23rd Congressional District seat on Wednesday in Oswego. In announcing his campaign at Vona’s Restaurant, he vowed to bring “North Country values” to Washington. He said he has spent virtually every day on the road the past four months talking to people in the 11-county district. People want the deficit brought under control and have a balanced budget in Washington, he added. Most importantly, they want to see the economy begin to grow again, he said. “They want the opportunity for themselves and for their children and grandchildren to have good paying jobs,” he continued. Doheny is seeking the endorsements of the Republican and Independence parties. His parents instilled the importance of hard work and discipline in him as a child, he said. Like so many other parents in the district, his parents lost their son to better opportunities elsewhere, he said. “Those opportunities for me included moving to New York to help restructure companies â€“ saving and maintaining the jobs people relied on,” he said. After his father died, he made a special effort to come home every weekend. That, he said, reminded him how special the communities of the 23rd District are. So he bought a home a moved back to stay close to family and friends. To give people in the district the opportunity to live the American Dream, they have to change the tone of what’s going on in Washington, DC, he said. His opponent has followed the whims of Nancy Pelosi and the Washington crowd, Doheny said. Help is on the way, he continued. He also vowed to strongly support Fort Drum and all the military. after 8 years of corruption from the Republicans and war for porfits_ I think most common sense folks can sse that the Republican party is done enough damage to this Great Nation and will seek to elected any other then someone from the Republican party. well, well. a republican sounding like a republican. he obviously learned that from mr. hoffman, who by the way, ill be voting for and i strongly urge mr. williams and the rest of the gop committee in oswego county to endorse him as well.